Doctors are increasingly e-prescribing. Watertree Health offers tips on how to save money on medications sent electronically. Digital prescriptions are convenient and thwart theft as well as forgery. Watertree Health is addressing the rise of e-prescriptions by providing digital tools. As of March 27th, in New York it is legally mandatory that doctors send all prescriptions electronically. In other states, at least 40% of physicians are e-prescribing. This rate is likely to grow because digital prescriptions are convenient and thwart theft as well as forgery. Electronic prescriptions also reduce medication errors because pharmacists will no longer need to decipher handwriting. According to the U.S. Food and Drug Administration, illegible prescription writing causes 1.3 million injuries a year nationwide and at least one death daily. 1. Pick the pharmacy where the prescription is to be sent by going to http://www.RxPriceSavings.com. Just need to enter the drug name and zip code to see the savings at local pharmacies. 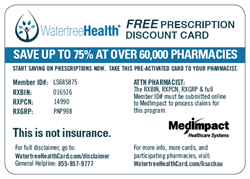 The Watertree Health Prescription Discount Card is accepted at 95% of pharmacies nationwide. 2. If prescription has already been sent, and it is not covered by insurance or co-pay is high, text the word “CARD” to 95577 for a ready-to-use card that provides immediate savings. All prescriptions are eligible for discounts up to 75% with the Prescription Discount Card. 3. Can also go to http://www.WatertreeHealthCard.com and click “get your free card”. Show the pharmacist the discount codes on the phone. 4. For future use, save the discount codes on the phone by taking a screen shot.